Bruner, Charles, Anne Discher and Hedy Chang, Chronic Elementary Absenteeism: A Problem Hidden in Plain Sight, Child and Family Policy Center and Attendance Works, November 2011. 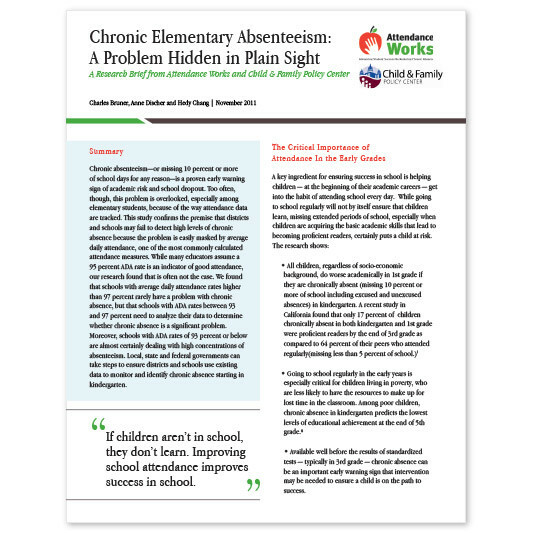 This study confirms the premise that districts and schools may fail to detect high levels of chronic absence because the problem is easily masked by average daily attendance, one of the most commonly calculated attendance measures. While many educators assume a 95 percent ADA rate is an indicator of good attendance, the authors find that is can sometimes mask a problem with chronic absence.